“I was on the right track, or what seemed like the right track, to doing everything you would want to do in life and everything that parents would ever want from their kid,” said Brad Blount, his image playing on a large screen in the crowded ballroom of Vestavia Country Club. An organization whose vision is to prevent substance abuse in central Alabama, the Addiction Prevention Coalition strives for its goal by pushing for community collaboration. One way the group spreads its message is through events like the “Wake Up!” breakfast, where recovering addicts like Blount share stories and provide parents with the tools to best approach their own children about drugs and alcohol. The breakfast featured Blount and another young adult whose stories of addiction hit close to home. 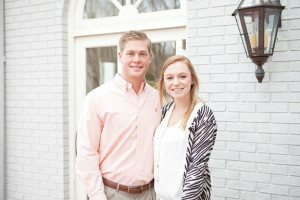 Suzie Sarcone, a 17-year-old student at Mountain Brook High School, and Blount, a graduate of Vestavia Hills High School, have led lives deeply affected by substance abuse. “I wasn’t drinking because I liked it, I was drinking to get drunk,” Sarcone said. Sarcone said she grew up in a family environment where addictive behavior was prevalent and found that alcohol and drug abuse helped her to forget about her difficult home life. Blount’s opiate abuse began after a football injury to his shoulder, he said. He was prescribed Lortab – and later, Oxycodone – for his shoulder and quickly became dependent on the drug without realizing it. Once the pills ran out, his search for a quicker and cheaper fix led him to heroin, he said. Both Sarcone and Blount offered knowledge that parents might not otherwise be able to obtain. Each talked about what methods were most effective — and ineffective — on their journeys to recovery. Blount and Sarcone agreed that the greatest indicators of substance abuse are not physical symptoms. With eye drops and an extra layer of clothing, Blount said, he easily disguised his physical symptoms from his parents. She would also constantly ask for money, giving any excuse imaginable to get it, she said. Once the problem is identified, Blount and Sarcone said a parent must take care in how they approach their child. “Parents are going to pass judgment unconsciously,” Blount said, adding that parents must be aware of their tone in order to have truthful conversations with their kids. The goal is to be as open as possible to any discussion, whether the topic is good or bad, said Sarcone. Both speakers said, whether or not a child abuses substances, engaging in non-threatening discussions about drugs will keep them better-informed. But when a punishment must be put in place, Sarcone said, a parent cannot waver. She said when it comes time to lay down hard rules, it is important for intentions to be clear. Phrases like “I didn’t raise you that way” are counterproductive, Blount said. “Be careful about shaming your kid. We know you didn’t ‘raise us that way,’” he said. Both speakers said a parent should avoid extremes, such as forbidding a child from seeing certain people or going to certain places. “It’s like telling them not to eat the cookie,” Sarcone said. Adults must always remember what it is like to be a teenager, when every disappointment seems life-altering, said Blount. He said his parents came to terms with results of the injury long before Blount could himself, and it was that injury that eventually led to his addiction. Both Sarcone and Blount stressed that it is not always parents’ fault when a child becomes involved in addictive practices. Parents cannot make their children’s choices for them, but they can shape the way their child chooses to behave, they said. “My goal is to prevent other people from going through what me and my family experienced,” Sarcone said. During her recovery, Sarcone said, she and her mother have found a balance and have reached a state of open discussion. With the help of Sarcone and Blount, APC is opening drug-related discussions in a community-wide setting in order to promote similar discussions inside the home. “The greatest challenge we face is getting the community to be open to discussing these issues,” said Steve Briggs, APC founder and board member.